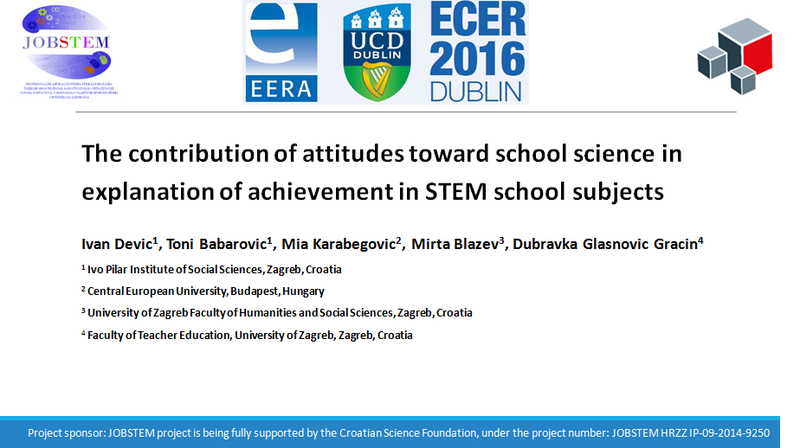 Below, we present the third JOBSTEM study from the ECER conference in Dublin, titled The contribution of attitudes toward school science in explanation of achievement in STEM school subjects (authors: Ivan Devic, Toni Babarovic, Mia Karabegovic, Mirta Blazev & Dubravka Glasnovic Gracin). Find the previous two posts here and here. STEM achievement of Croatian students has consistently been shown to be low in comparison to their other school subjects - in both specific scientific studies (Burušić, Babarović, & Šakić, 2008), and larger international research projects (e.g. PISA). The debates about what determines achievement in STEM school subjects in primary school still persist. Several STEM-relevant variables show a significant association with achievement in math and science, including student level variables, school level variables and variables related to their broader social environment (Hattie, 2009). The specific aim of our study was to identify the contribution of students’ attitudes to school science and experiences with STEM subjects in explaining STEM school achievement, after controlling for individual characteristics, family-related variables and experiences in out-of-school activities. The variables used correspond to Huitt’s (2003) Transactional model of the teaching/learning process, a framework which posits several different domains which produce learning outcomes: input (students’ and teachers’ individual characteristics), context (environmental factors that might have an influence on the outcome) and classroom processes. We collected data from 360 primary school students (aged 12 to 15; M=13.32; 165 female) enrolled in three schools from the Daruvar municipality, Croatia. Scales used as predictors in the survey were mostly derived and adapted from the ASPIRES project (Archer et al., 2013; DeWitt et al., 2013), and the output, STEM school achievement, was measured as a composite of school marks (GPA) in different STEM subjects in the previous grade. The predictors used in the study encompassed students’ gender, the education status of their parents, parental ambitions and support of the students’ education, parents’ attitudes toward science, students’ positive and negative image of scientists, interest in science outside of the school context, and attitudes toward school science. Hierarchical regression analysis was applied in order to predict achievement in STEM school subjects, with the first block of predictors pertaining to input and contextual variables, and the second block being the attitudes toward science in the school context. STEM achievement is related to parental education, and parental ambitions and support. However, its relation to out of school STEM activities, and perception of scientists is not as pronounced. Attitudes toward school science, a variable reflective of Huitt’s classroom processes concept, was an important predictor of STEM school achievement, in that it added a significant proportion of the variance accounted for by the model, above and beyond the personal and contextual factors considered. Archer, L, Osborne, J, DeWitt, J, Dillon, J, Wong, B & Willis, B (2013). ASPIRES: young people’s science and career aspirations, age 10-14. King’s College London, London. Burušić, J., Babarović, T., & Šakić, M. (2008). Vanjsko vrednovanje obrazovnih postignuća u osnovnim školama Republike Hrvatske: Učenici 8. razreda, školska godina 2007/2008., istraživački izvještaj. Zagreb: NCVVO/ Institut društvenih znanosti Ivo Pilar . DeWitt, J., Osborne, J., Archer, L., Dillon, J., Willis, B., & Wong, B. (2013). Young children’s aspirations in science: The unequivocal, the uncertain and the unthinkable. International Journal of Science Education, 35(6), 1037-1063. Hattie, J. A. C. (2009). Visible learning: A synthesis of over 800 meta-analyses relating to achievement. New York: Routledge . Huitt, W. (2003). A transactional model of the teaching/learning process: A summary. Educational Psychology Interactive. Valdosta, GA: Valdosta State University.